The imitations done by the Marxes in the Theatrical Agency-skit was changed over the years in various performances of On The Balcony and I'll Say She Is, alternating between their uncle Al Shean and his partner Ed Gallagher and the stuttering comedian Joe Frisco. Frisco was born Louis Wilson Joseph in Milan, Illinois, near Rock Island, in the early or mid 1890s and died of cancer on 16 February 1958. 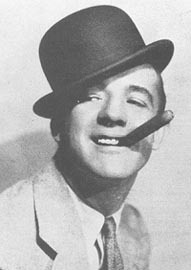 In his time, Joe Frisco was famous for his jazz dance (or "Jewish Charleston", as Variety called it in their obituary of him) and for his wit, being a notable stand-up comedian for twenty-five years. Groucho said that Frisco "was a good comic and a great dancer. We'd imitate his dance in our show. It was a kind of tap dance, and he was associated with it." Joe Frisco made his Broadway debut in Florenz Ziegfeld's Follies in 1918. Ed Lowry and Charlie Foy tells us of the debut in Joe Frisco - Comic, Jazz Dancer and Railbird: "To the tune of 'The Darktown Strutters' Ball', he, his derby hat, and the king-sized cigar made theatrical history. He puffed on the corona, shuffled his feet, rolled his hips, and contorted his body just as he had always done in the honky-tonks". Lowry and Foy also adds that Frisco was "backed by twenty-four beautiful girls attired in leotards, short jackets, and bowler hats and puffing on big 'prop' cigars". The Darktown Strutters' Ball became Joe Frisco's theme. Lowry and Foy mentions an occasion when the orchestra started to play the tune as Frisco happened to enter a restaurant. Another impromptu happening occured at a club when Bing Crosby sang the tune and Frisco danced. It was also revived in the film Atlantic City in 1944, in a nightclub scene recreating Ziegfelds Follies. In the 1920s, Joe Frisco played the major vaudeville houses and in the 1930s, the top restaurants clubs. In the 1940s, he moved to Hollywood, made a few movies, haunted the racetrack and made Charlie Foy's supper club the place to go. 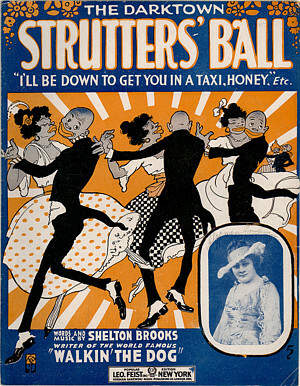 Despite the fact that Darktown Strutter's Ball was written by the African American composer Shelton Brooks, it isn't a "politically correct" title today and maybe that's why this song has been ignored in most of the Marx-literature. Among other songs, Brooks also wrote Walkin' The Dog (paraphrased in the lyrics to the right) and Some Of These Days. The Marx Brother's Scrapbook by Richard Anobile has a quote from Groucho that confirms that the Marxes indeed used Joe Frisco's trademark song when they imitated him;"The first part of the show was some sort of an office scene and we'd all come out and introduce ourselves with a song that began "My name is Sammy Brown, I just came into town..." and somehow we'd end up with the Darktown Strutters Ball." When they play the "Jelly Roll Blues"
An exhibition of the "Baby Dolls"
When we step out and "Walk The Dog"